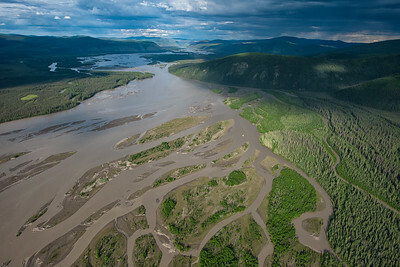 Aerial view of the Yukon River, and the side channels and sloughs where the salmon spawsn. In Whitehorse, a fish hatchery is used to restock a number of salmon bearing creeks upriver of the Whitehorse dam. 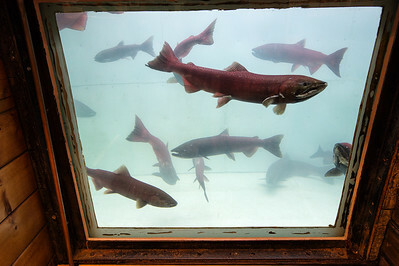 The salmon are released every spring into the creeks and these hatchery salmon are used as a type of compensation for the salmon fry who die passing through the dam on their migration to the ocean. At his stage in their development they are called Alevins. 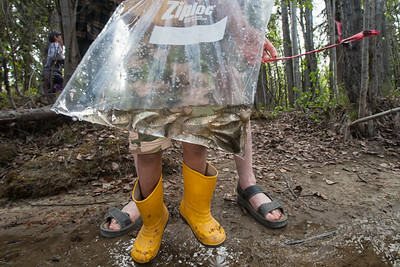 Salmon Fry released into Wolf Creek near Whitehorse, Yukon. 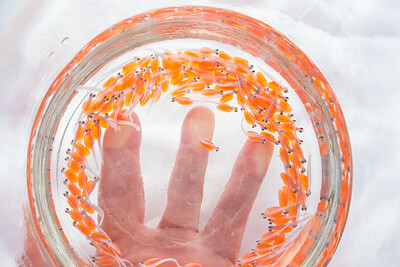 The Chinook fry are being used to help recover the devasted salmon stocks of the Yukon River System. 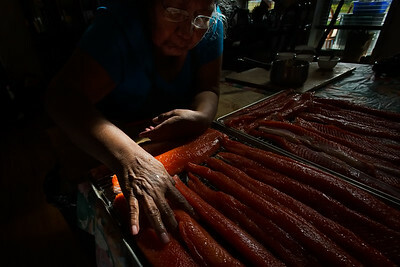 A Tesling Tlingit elder cleans salmon for canning. Unable to get fish from their river, the Teslin people fly salmon from the Taku Drainage into their community. 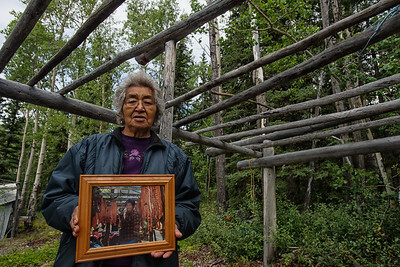 The Teslin Tlingit people of the Yukon, have voluntarily stopped fishing for Chinook Salmon due to the drastically decreased numbers migrating to their traditional territory. For 15 years, they have chosen not to catch any salmon, in the hopes that the salmon numbers can rebound for future generations. 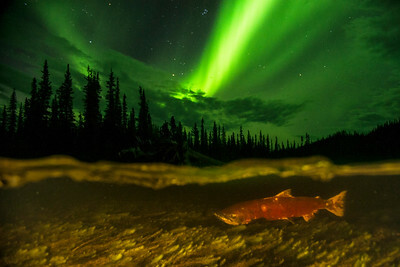 The Yukon River chinook salmon is a threatened species after decades of significant declines. 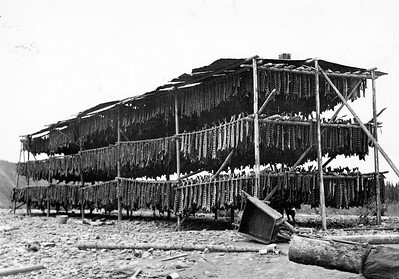 The Teslin Tlingit culture is based around salmon so, it is a strong sacrifice. The project has documented the old salmon camps, that are now lonely outposts, hoping to one day see the salmon culture revived. Salmon Camp for the Nacho Nyak Dun First Nation. 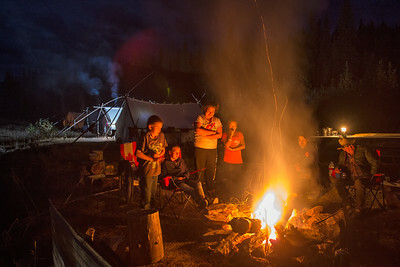 The camp, held at Fraser Falls on the Stewart River, is to compensate for the loss of the Chinook Salmon for the community of Mayo. In 2014, the Nacho Nyak Dun passed a resolution to not fish for the Chinook Salmon that migrate through their waters. 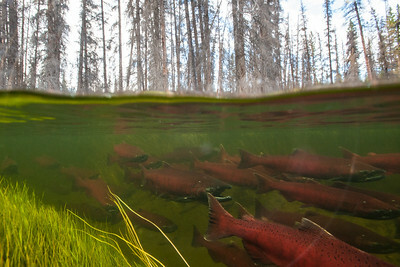 Although, they are salmon people, they want to see the failing Chinook Stock return to a sustainable population. The camp, organized by the First Nation, is designed to compensate for the loss for food and cultural activities. The evenings at the fish camp were spent around the fire listening to elders, like Jimmy Johnny, and Frank Patterson telling stories. Graveyard at Little Salmon Village along the Yukon River. 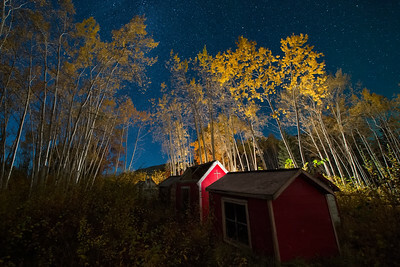 The village which is abandoned now, was once a thriving fishing community. The population was wiped out in 1917/1918 by an influenza epidemic. 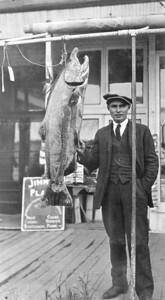 The Little Salmon Carmacks first nation peoples mostly reside downriver in Carmacks. 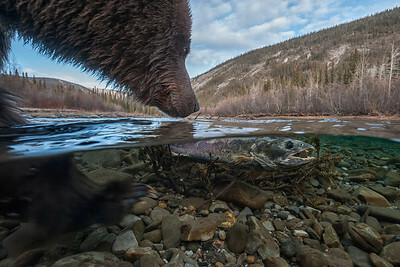 The Teslin Tlingit people of the Yukon, have voluntarily stopped fishing for Chinook Salmon due to the drastically decreased numbers migrating to their traditional territory. 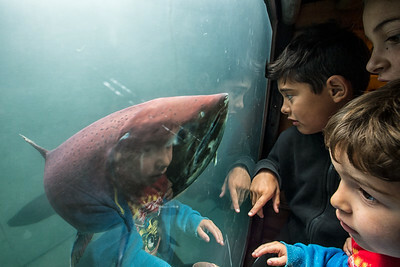 For 15 years, they have chosen not to catch any salmon, in the hopes that the salmon numbers can rebound for future generations. 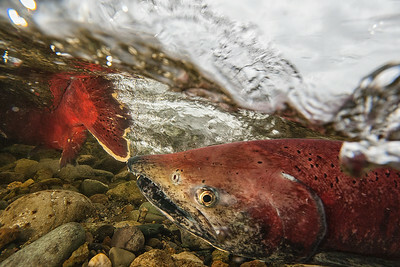 The Yukon River chinook salmon is a threatened species after decades of significant declines. 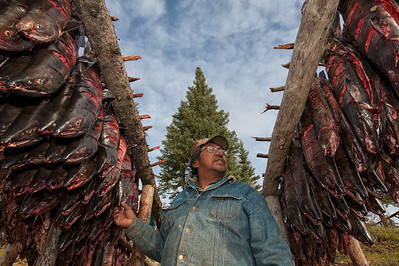 The Teslin Tlingit culture is based around salmon so, it is a strong sacrifice. 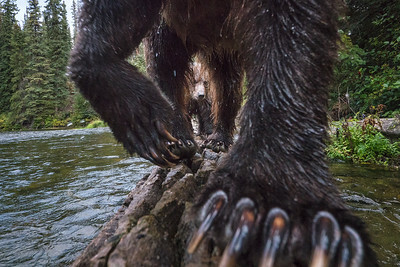 The project has documented the old salmon camps, that are now lonely outposts, hoping to one day see the salmon culture revived. Placer mining in the Klondike Valley. Americans on the Yukon River worry about the effect of placer mining in salmon spawning rivers, while Canadians are concerned by overfishing on the Alaskan portion of the River. Before the Gold Rush, the Klondike River was one of the best spawning rivers in the entire Yukon Watershed. 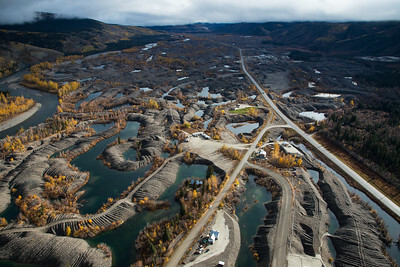 Placer mining throughout the Klondike has devastated the salmon run in the region. Placer mining on some creeks, can create wonderful salmon spawning habitats, but their has always been conflict between salmon conservationists and placer miners. 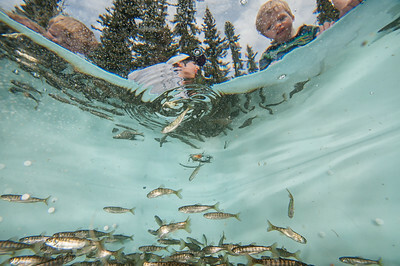 Hopefully, in the future miners and fish biologists can work together to the benefit of all.